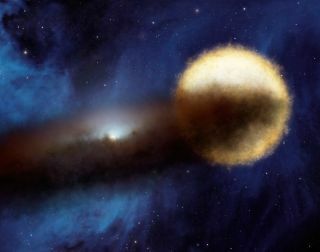 An artist's image of the Epsilon Aurigae system, with a dusty disk swirling around a companion star. For nearly 200 years, astronomers have puzzled over the strange dimming process of the bright winter star Epsilon Aurigae. Now, thanks to precise distance measurements from the European Space Agency's Gaia satellite, scientists have pinned down the mass of the two stars involved in the process, and how their exchange of material has caused decades-long eclipses visible on Earth. Every 27 years, Epsilon Aurigae dims for a two-year period. Scientists have speculated about what caused the eclipse: a cloud of meteors, a black hole, another star or a disk of material. Before the most recent eclipse, in 2010, astronomers began to suspect that the system contained two stars surrounded by a cloud of gas and dust. But the nature of the pair of stars remained a mystery. "This is a pretty active system," Stencel said. "The F-star is boiling off, [and] the companion is grabbing material, producing a big dusty disk." F-type stars are slightly larger and slight warmer than the sun. In 1821, German amateur astronomer Johann Fritsch first noticed that Epsilon Aurigae had become 2.5 times less bright from Earth's perspective, a "magnitude" on the astronomical scale of brightness, over the previous year, then slowly returned to its previous brightness. Intrigued, astronomers studied the star in 1848 and 1876, and labeled the object an "irregular variable," a single star changing in brightness. In 1903, astronomers closely observed the star, tracking a six-month decline in brightness followed by a year-long constant state of dimness, then another six months to return to its original status. Astronomers determined the star had a radius 3,000 times as large as the sun, making it the largest known star in the universe. Measurements of the 2010 event revealed that the eclipse was caused by a monster-size disk passing in front of an F-type supergiant. A second, dimmer star lay in the heart of the disk. But scientists weren't ready to put the 200-year-old discussion to bed yet, and they continued to debate the supergiant star's nature. Supergiant stars are the largest stars in the universe, and they can weigh up to 100 solar masses. (A solar mass is equal to the mass of the sun). "The debate has been whether it is a supergiant — we expect a 10 to 20 solar-mass star — or whether it's some kind of phony supergiant," Stencel said. He explained that it could instead be "a little wimpy thing; that is, a core and a big envelope [of gas]." The so-called supergiant could actually be a star about the mass of the sun. "It has been impossible to prove," Stencel said. Observations with NASA's Spitzer Space Telescope and the ESA's Herschel Space Observatory after the 2010 eclipse helped whittle down those numbers, but without precise distances, astronomers couldn't get the most accurate masses of the stars. In 2013, the ESA launched Gaia, with the ambitious plan to map the billions of stars of the Milky Way in 3D. The ESA released Gaia's second batch of data on April 25, 2018, providing precise distances to a number of stars — including Epsilon Aurigae. The new data revealed that the strange eclipsing system lay about 1,600 light-years away, Stencel said. Previous estimates ran as high as 6,400 light-years. The refined distance allows astronomers to determine the true sizes and masses of the stars, details that are critical to understanding the system. Previously, many researchers estimated the two stars weighed 15 and 12 solar masses, respectivelybut Gaia's precise distance measurements rule those numbers out. Using the ARCES instrument on the 3.5-meter telescope at Apache Point Observatory in New Mexico, Stencel and Gibson studied the system during the 2010 eclipse. Their research confirmed the presence of a stream of material feeding the disk, revealing that the stars were still transferring their mass from one to another. According to their simulations, the dimmer star originally weighed about 10 times the mass of the sun, while the now-bright star was just under five times as heavy as the sun. The two stars circled one another every 100 days. Typically, higher-mass stars evolve faster than their lower-mass counterparts. However, in Algol binaries such as Epsilon Aurigae, the lower-mass star evolves faster as it gobbles up material from its companion. That's probably what happened to the strange dimming star, Stencel said. Over 20 million years, the more massive star dumped its material, most of which ended up on the companion. The once-larger star shrank while its companion expanded. Today, the once-larger star has become a 2.2 solar-mass cool F-type star, while its companion became a 5.9 solar-mass B-dwarf surrounded by a disk, according to the ArXiv.org blog Astrobites. Their research was published in March in the journal Monthly Notices of the Royal Astronomical Society. The strange mass-sharing Algol binaries may become even more interesting in the future if they collide. "Any number of these stars has the potential to grow up into a gravitational-wave source," Stencel said. Previously, scientists have identified gravitational waves produced by pairs of neutron stars sharing material, much like what Algol stars do. While astronomers will continue to pore over the data collected during Epsilon Aurigae's most recent eclipse, that doesn't mean they won't be looking forward to the next event. "It will be roughly in 2037, so mark your Daytimers," Stencel said.